Today's giveaway is thanks to the wonderful Irish online shop Cloud 10 Beauty, and it's another good 'un! Cloud 10 ship internationally so the giveaway is open everywhere, and they're a pleasure to buy from - delivery is quick and they offer free returns and free samples. It's probably just as well they're shipping the prize, because I'd be quite tempted to keep this one for myself. Worth €65, it includes the Sigma Eyes Kit, with 7 professional quality eye brushes, and a Sleek Oh So Special palette to try them out on! Both of these brands are raved about in the beauty community so the winner will be in for a treat. To enter just follow the simple steps below. awesome competition :) badly in need of some new brushes! Love this! Need a brush set! Awesome prize, the palette colours are very pretty! oh wow! Amaazzinggg giveaway! Ive been lusting after Sigma brushes for ages and was considering asking for a set for christmas! Amazing! I want to try Sigma so much! What a fantastic giveaway!! Good luck everyone!!! I'd like to win please! Thanks. Awesome goodies! That's one of the few Sleek palette I don't already have! I'd love to get some Sigma brushes, I hear they're fantastic. I love Cloud10, I order stuff from there a lot! Congrats Emma on the Blog Award victory at the weekend- well deserved and I hope it spurs you on even more to keep churning out more great posts. Amazing giveaway- please count me in. Aah I've always wanted to try a sleek palette! I hope you're enjoying your holidays missus! Dying to try out some sigma brushes, it's one of those things that's always on my want list! I've never tried Sigma brushes but they look fab. I think brushes make a great gift and I love sets like this. Cooooool! I don't have any sigma brushs or sleek! A brush set is so essential! I hope you're having a good vacation! That eye shadow palette is GORGEOUS! I've never heard of Cloud 10 makeup - thanks for having this giveaway because you've now introduced me to this line! Great job on all the prizes! Would love to win this! You are spoiling us Emma! Oh, the prize is awesome! amazing giveaway!thanks for this prize. Oh wow amazing! I need new brushes and that palette is amazing! I've wanted to try both Sigma brushes and Sleek shadows for aaages!!! Great giveaway! 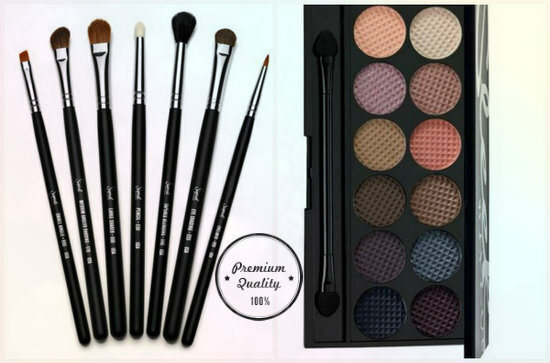 I would really love to win these brushes and palette they seem like a lot of fun i am a self taught makeup artist and the brushes i have are falling apart i really could use some new ones =}. thankyou so much for this awesome giveaway!! wonderful prize! thanks for the opportunity!! I would really love to win!! I wish I had the luck to own those Sigma brushes :( !! hi my dear....i'm so happy to enter...hoping to win! enter me! I hope to win! Love the competition - but delighted we can now easilybuy from Ireland! Thanks for the great giveaway!! Finger crossed!! This is amazing! Thank you so much for the chance! So in need for this sigma eyes kit! thank you for this beautiful giveaway, I hope I win! Wow what a brilliant giveaway.I could desperately do with some new make up+brushes! My collection hasn't been rounded out fully, I'd love this set! Amazing choice of prizes, yay, thanks! Ooh sigma brushes, would love to try em! I would be a very lucky girl to win. you are amazing with the giveaways!! Oh wow, I would love some new eyeshadow brushes! I don't have any of the sleek palettes in my collection. I really should change that. Awesome giveaway! Enter me please! I've ALWAYS wanted sigma brushes! I've never used sigma brushes before. Love Sleek palettes and really want to expand my brush collection. It's looking a bit sad at the moment! !